TMDHosting Review 2019: Is TMDHosting a Good Hosting? Since its establishment in 2007, when it offered basic open source web hosting, TMDHosting has advanced considerably to provide high-speed, redundant, cloud-based web hosting services. 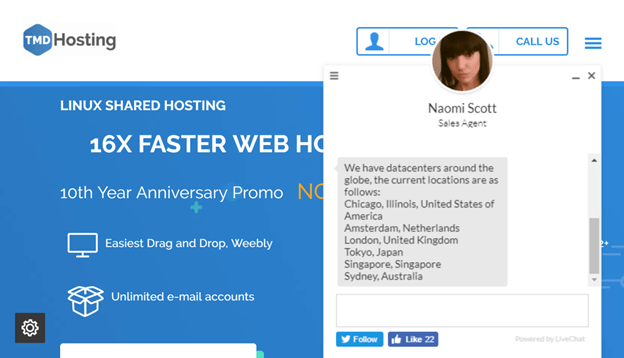 TMDHosting has a presence in multiple countries including the U.S., Singapore, the Netherlands, the United Kingdom, Australia, and Japan. In 2017 it was hosting more than 300,000 websites. TMDHosting’s website is in English. The Linux and Windows shared hosting plans are very similar except that the Linux plans come with NGINX web server and the Windows plans come with the most recent ASP .NET framework. Also, the entry-level Linux plan only supports a single website whereas the Windows package starts with hosting for up to six websites. You get the cPanel (for Linux) or Plesk (for Windows) control panel to manage your hosting environment, and both control panels include a free Weebly website builder that lets you create a website using an intuitive drag-and-drop interface. Both control panels also feature the Softaculous auto-installer so you can install more than 300 applications with ease. If you already have a website hosted with another host, TMDHosting’s specialists will migrate your website for free. Unlike many competitors, TMDHosting provides unlimited SSD storage and unlimited bandwidth even with its well-priced entry-level hosting plans. The Windows plan is slightly more expensive than the Linux plan (as is common), but it does allow you to host up to six websites rather than just one. This vendor is so confident about its services, it gives you a very generous 60-day money-back guarantee that means you can go in with the ability to get out if you’re not entirely happy. It also offers various discounts, with up to 65% discounts on the Linux plans and up to 60% discounts on the Windows package. You can purchase Linux and Windows plans on annual, biennial and triennial terms, with a monthly option also available for Linux hosting. Payments can be made by bank transfer, credit/debit cards, or PayPal. TMDHosting provides 24/7/365 support by telephone, ticket, email, and live chat. For quick and comprehensive responses you can choose live chat, as I did, or simply support yourself using the comprehensive FAQ-like knowledge base. TMDHosting has over ten years of experience in providing excellent, comprehensive, high-performance shared hosting with premium SSD hardware for fast website loading speeds. Wondering how TMDHosting stacks up against other Web Hosting companies? Enter any other Web Hosting company and we will give you a side-by-side comparison.